Ladies, we are paid less then gentlemen. How much less? The numbers vary, as The Wall Street Journal and NPR both explained. 77 cents for every dollar a man makes. This number is calculated by comparing annual earnings of women to men. Some suspect it because on average women are in career fields (ex. education) that pay less than men (ex. manufacturing). Plus, women work fewer hours. 88 cents for every dollar a man makes. According to the Bureau of Labor Statistics, this number is calculated when men and women with a 40-hour work weeks are compared. Regardless of how the figure is calculated, (ex. similar hours, similar responsibilities) women always come up with the short end of the stick. I recommend using Glassdoor and PayScale to see how much $$ others are raking in. 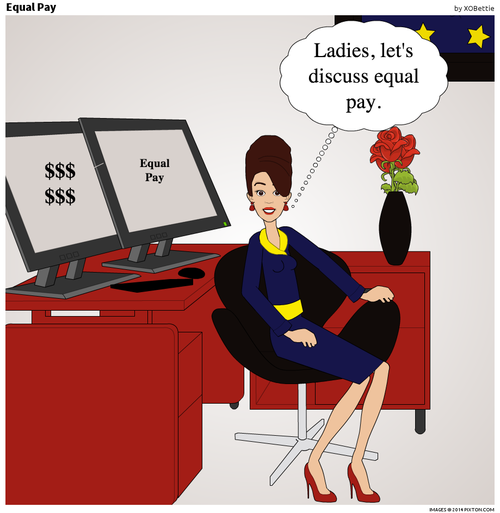 Go get those equal paycheck, ladies!